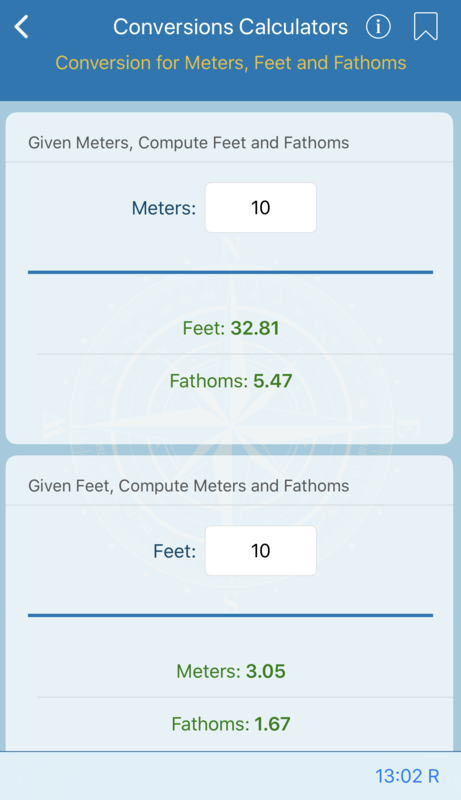 These calculations help you to easily and quickly convert chart scales, nautical and statute miles, fathoms, feet, meters, barometer pressure and more. This table gives the numerical scale equivalents for various natural or fractional chart scales. The scale of a chart is the ratio of a given distance on the chart to the actual distance which it represents on the earth. The scale may be expressed as a simple ratio or fraction, known as the natural scale. For example, 1:80,000 or 1/8000 - means that one unit (such as an inch) on the chart represents 80,000 of the same unit on the surface of the earth. The scale may also be expressed as a statement of that distance on the earth shown as one unit (usually an inch) on the chart, or vice versa. This is the numerical scale. The calculation formula was computed using 72,913.39 inches per nautical mile and 63,360 inches per statute mile. 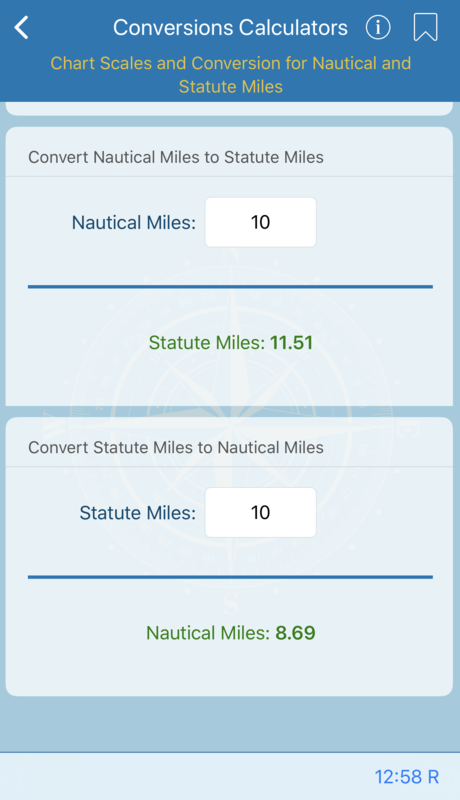 This calculation gives the number of statute miles corresponding to any whole number of nautical miles and the number of nautical miles corresponding to any whole number of statute miles. Thus, 2,700 nautical miles are equivalent to 3,107.1 statute miles, and 0.3 statute mile is equivalent to 0.2607 nautical mile. 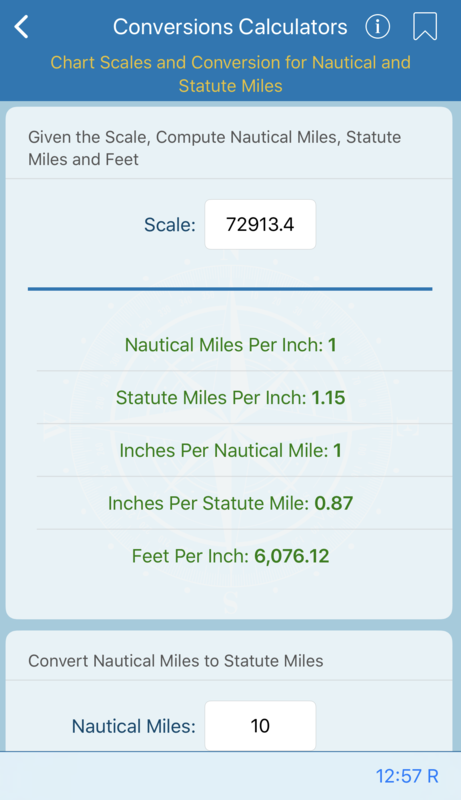 1 statute mile = 0.86897624 nautical mile. The number of feet and fathoms corresponding to a given number of meters, and vice versa, can be calculated here. Thus, 420 meters are equivalent to 1378.0 feet, and 11.2 fathoms are equivalent to 20.483 meters. 1 fathom = 6 feet. 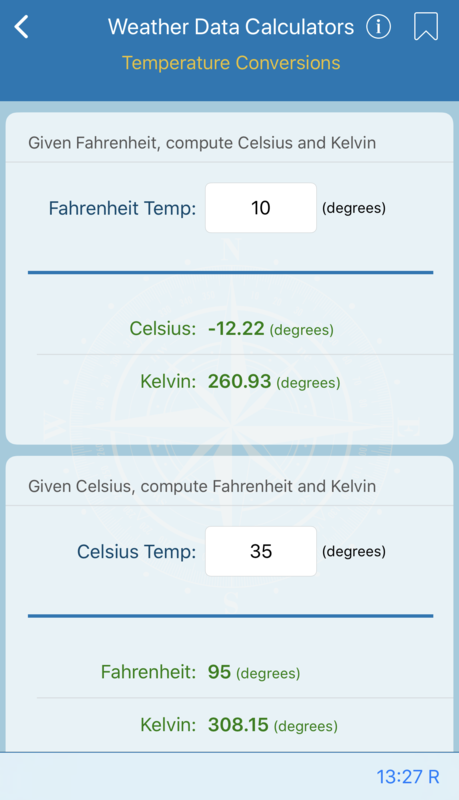 This calculation converts Fahrenheit, F; Celsius (centigrade), C; or Kelvin, K; temperature scales. On the Fahrenheit scale, the freezing temperature of pure water at standard sea level pressure is 32°, and the boiling point under the same conditions is 212°. The corresponding temperatures are 0° and 100° on the Celsius scale and 273.15° and 373.15°, respectively, on the Kelvin scale. The value of (–) 273.15° C for absolute zero, the starting point of the Kelvin scale, is the value recognized officially by the National Institute of Standards and Technology (NIST). 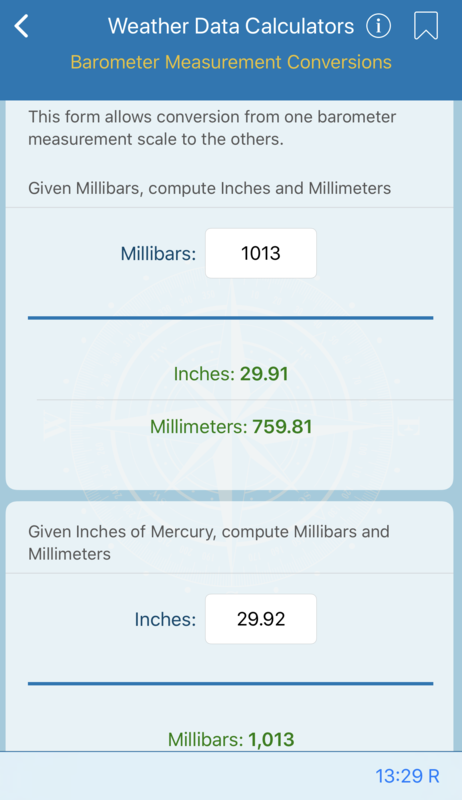 This calculation allows conversion from one barometer measurement scale to another including millibars, millimeters of mercury, and inches of mercury.